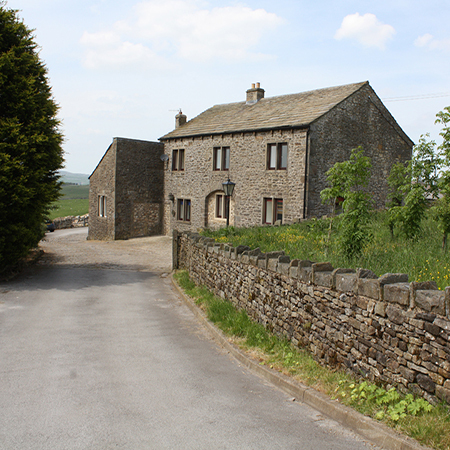 At almost 1000 feet altitude, with spectacular panoramic views of Wharfedale, our bunk barn above Grassington is a magnificent spot offering comfortable budget accommodation for groups of up to 34 people. Newly converted to a bunk barn in 2014, the former farmhouse is beautifully appointed by the Kent family who own the adjacent furniture business, Royal Oak Furniture. Iron Age settlements and well-preserved lead mine workings are visible from the barn and fascinating to explore. Down the hill, the Yorkshire Dales village of Grassington with its cobbled square and numerous pubs, cafes and an award-winning restaurant provides a wealth of choice if you don’t want to cook here for your group. It also boasts outdoor clothing shops, a prize-winning butcher, delicatessen, mini-supermarket, a bookshop, post office, several galleries and gift shops so you’ll find everything you need within walking distance. The accommodation of the barn is on 2 levels and can sleep up to 34 in 4 bedrooms split into 6-12-12. We offer a separate leader/disabled bedroom complete with private toilet and shower facilities which sleeps up to 4. On the upper floor, a large dining area features an open plan kitchen equipped with all that you will need for large groups in a layout that encourages communal activity. There is also a lounge area with Freeview TV, though you may be content with the dramatic views of Wharfedale from the window! For those needing to keep in touch with the outside world we have mobile phone coverage on most networks and free wi-fi. On the ground floor we offer 3 bathrooms with 5 showers and 5 Wc s along with a large drying / boot room. The barn is heated by an environmentally sustainable wood pellet biomass boiler which fuels radiators in all the rooms and constant hot water which is all inclusive in your booking price. Outside there is a barbecue area and large locked bike storage facility and a large car parking area adjacent to the barn.